This oil painting was created in the summer of 2012. It is painted on canvas sized at 20"x 16". The setting is the docks at the port of Southampton (UK), as seen from Weston Shore. The paintings shows a large “Wallenius Wilhelmsen” car transportation ship docked beside a large grain silo, a landmark on the entrance to the port. 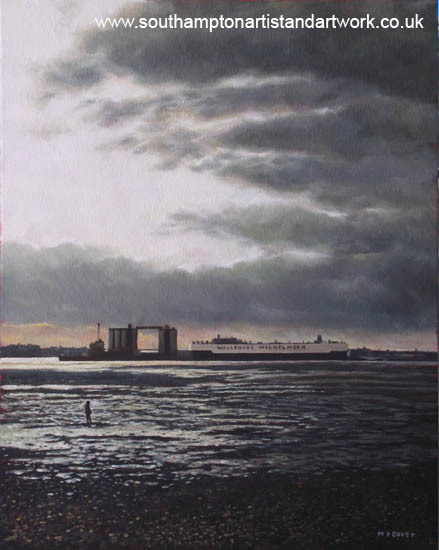 The oil painting is based on a crude photograph taken with a mobile phone during the early part of January 2012, during the last moments of daylight on a sunny, winters day. There were a number of people walking along the stony beach at Weston Shore. The tide was out and I placed a figure in the scene to help give the setting a sense of scale. The scene is quite bleak, cold and largely in silhouette and a large part of the composition is given over to the dramatic sky. It was painted in oils because of the requirement of painting this large area smoothly.